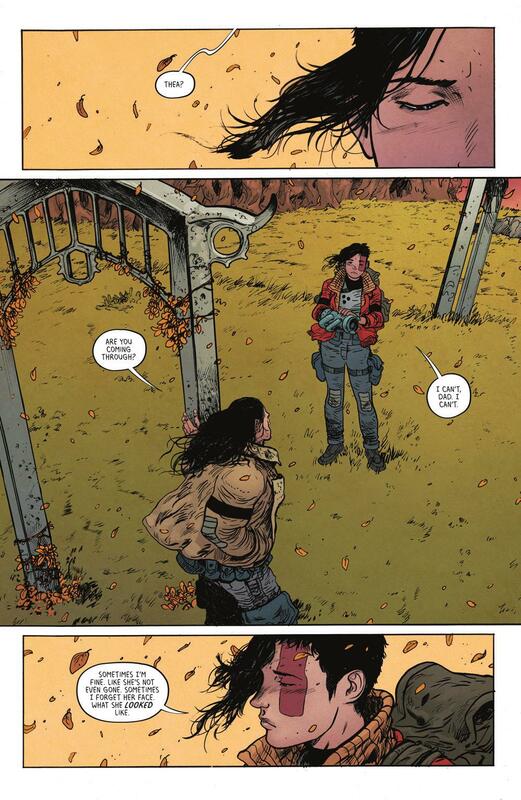 Extremity #4 Review – AiPT! 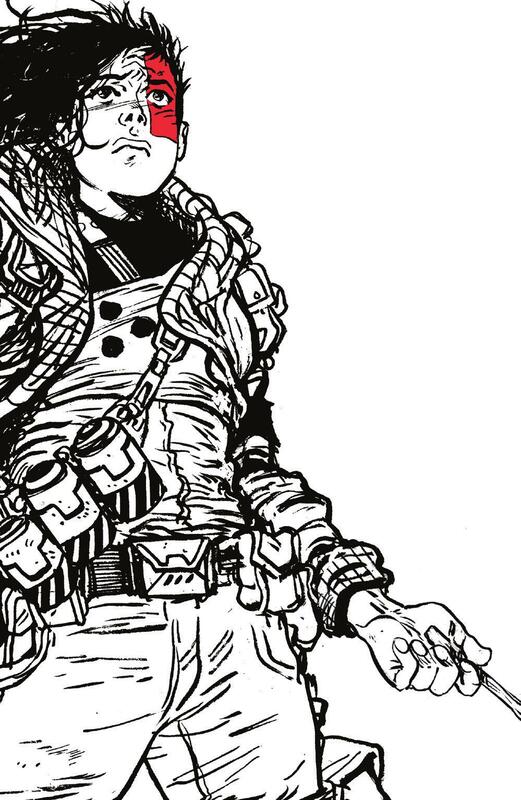 Another month, another excellent issue of Extremity by Daniel Warren Johnson. If you’re not reading this book, I really really hope you take a chance and pick it up. You’ll find what looks like a typical revenge story, but it is so much more. This issue continues the Roto clan’s campaign against the Paznina. After a short, sweet, sad opening scene between Jerome and Thea at their wife’s/mother’s burial site, the Roto attacks Dag, a former weaponeer and general who killed Jerome’s wife. The fight doesn’t go exactly as the Roto planned, and ends with some unexpected fallout. Throughout the series thus far, Johnson has done a great job subverting revenge story tropes, and here that continues. After seeing the sadistic Paznina general Brynjar last issue, I was expecting Dag to be just as cruel. Instead, he is a changed man trying to live out his life in peace with his wife. A repentant killer is not an uncommon trope; what was interesting, though, was that Jerome and Thea, two of our heroes, don’t accept his repentance. They are still willing to kill Dag and his wife. I think in most stories like this, the bad guy pleads for his life and the hero relents. Jerome is starting to look more and more compromised by his need for revenge. This is even more compelling when Rollo leaves the Roto with the de-powered Shiloh, trying to get away from their anger, fear, and hatred. Thea is smack in the middle between the two most important people in her life. Rollo seems convinced that she has already chosen her path, but she doesn’t seem as confident. This is such an awesome character dilemma, and raises the stakes for Thea even higher. So sure, some of these elements have been used before, but Johnson’s execution, character development, and slight subversion of tropes make everything feel very fresh and keeps us readers on our toes. So good. Also, that moment Dag’s wife recognizes the Shiloh model robot, so tantalizing! I can’t wait to find out more about our pacifist robot hero. Johnson’s art is as consistently excellent as his writing. Expressive, detailed line work, kinetic action sequences, great sound effects, great visual world building (especially those burial arches, great idea!). The only disappointment on the art front this issue was no full page or two page spreads. When Johnson has sparingly used them in the past, they really did a great job giving the comic a huge scope and feel. Perhaps because this issue was another more character-focused installment it makes sense. So yeah, I don’t know how many more ways I can say Extremity is a fantastic comic book. Even the letter column is great. This issue, someone wrote in about losing his fingers in a woodworking accident and how Thea’s loss and the comic book help him handle his own. Come on! Compelling storytelling in the freakin’ letters column!? Buy it, read it, love it. I don’t know how many more ways I can say Extremity is a fantastic comic book. Buy it, read it, love it. A"... Shiloh...? We never thought we'd see one of you"